So here in our neck of the woods, it's definitely fall. The birch trees are all decked out in their yellow leaves and the weather is overcast and crisp. I love this time of year. Time for jeans and cozy sweaters and new school supplies and baking bread while it rains outside. And time for soup. 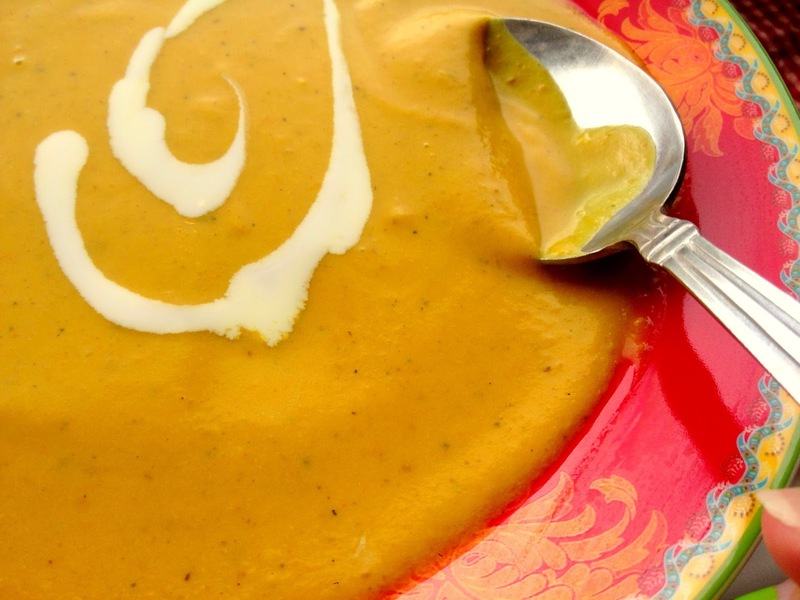 On a chilly day, a comforting bowl of soup is the perfect way to warm up. Add some rolls or a salad and you are all set. of pumpkin -- the ultimate autumn food. 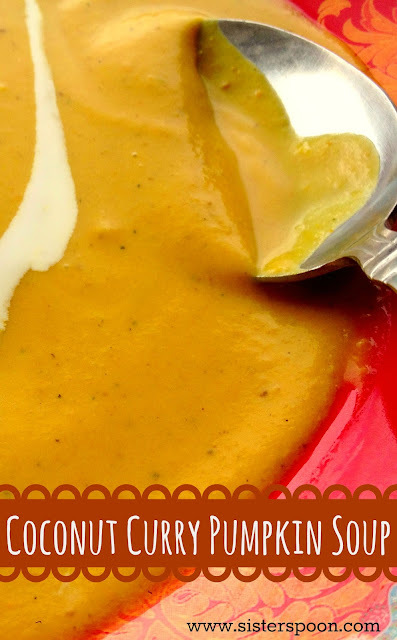 The ingredient list is pretty short, and although it kind of looks like a mess as you're cooking, it all comes together at the end with a few minutes in the blender. And it's delicious. 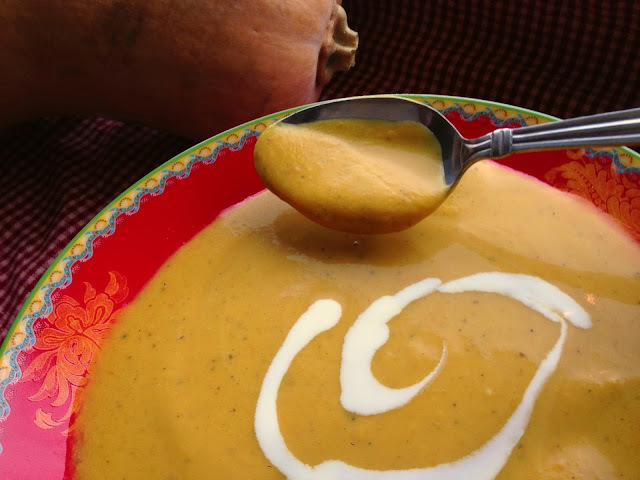 As you take a spoonful of soup, the spoon will hover motionless near your mouth for a few seconds while you savor the amazing flavors, forgetting about your spoon in mid-air. Mmmm. Fall. So, if you are using canned pumpkin, you can skip this step. As you can see, I'm technically not using pumpkin, but butternut squash instead. I can't get pumpkin until my neighbor's pumpkins are ripe and she gives us her extras. So for now, I buy butternut squash in the store and pretend it's pumpkin. Pretend with me. So if you don't have Libby's on hand to cook and can your pumpkin for you, this is what you do. 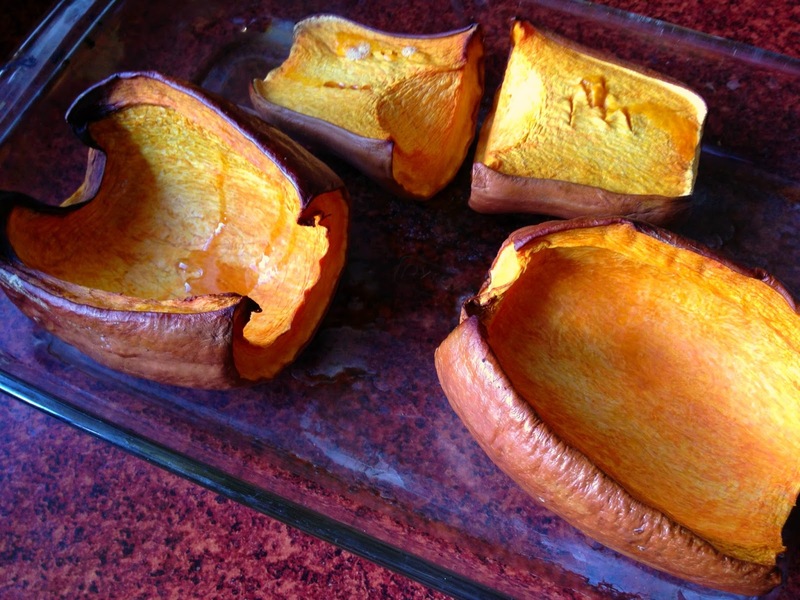 Cut up your gourd in manageable pieces and scoop out the guts. Put in a baking dish and bake for about an hour on 375F or so until the flesh is soft. 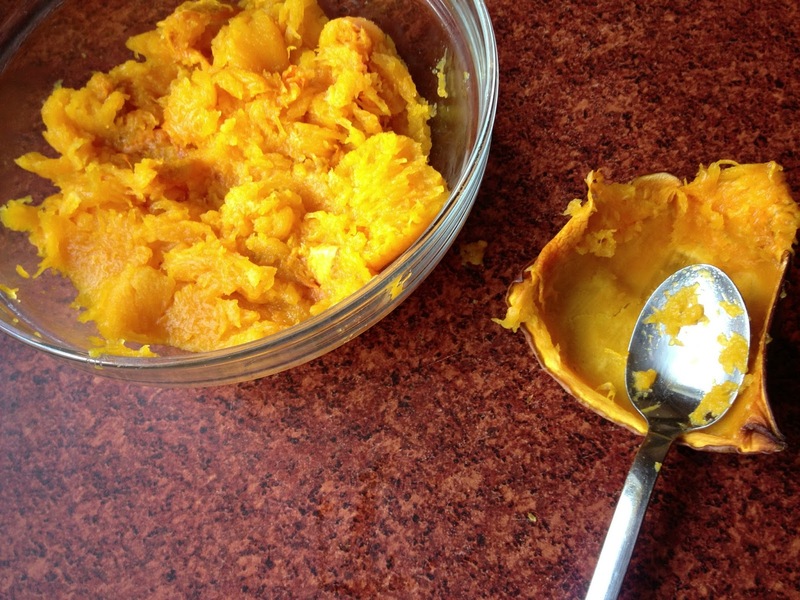 Scoop the pumpkin out of the skin with a spoon. For this recipe you need two cups of pumpkin. Now we are ready to get on with the rest of the recipe. 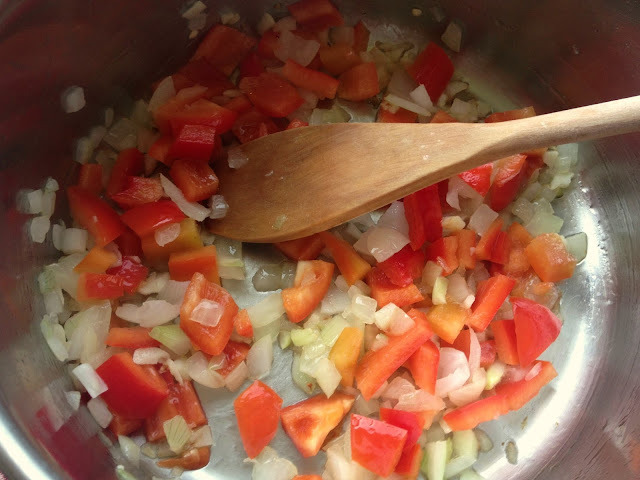 In a medium pot, heat up a little oil and throw in some chopped red bell pepper, onion and garlic. Stir them around until they get soft. 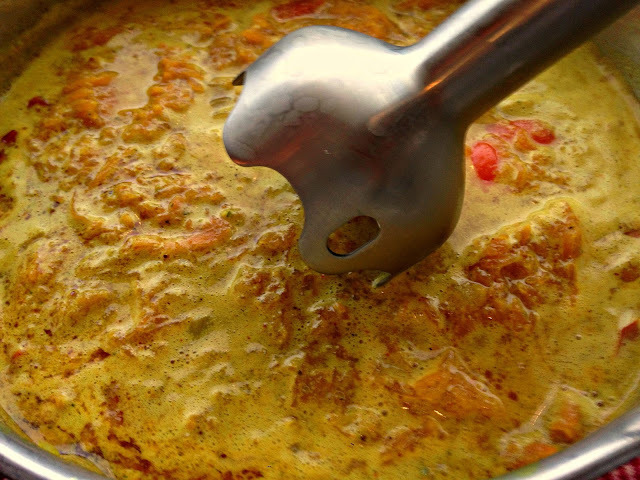 Now we add chicken broth (or water plus chicken bullion cubes), curry powder, pumpkin, coconut milk and cayenne pepper for a little heat. Ok, so this doesn't look very appetizing at the moment. Just wait. Now you can either use a hand blender, like the one I've got here, or you can pour the soup into a blender and do it that way. Either way, this is not the kind of soup where you want chunks. Make sure it's all nice and smooth. Puree the heck out of it. There. Isn't that lovely now? Salt to taste and enjoy. Saute the onion, garlic and bell pepper in a medium pot in a little oil. 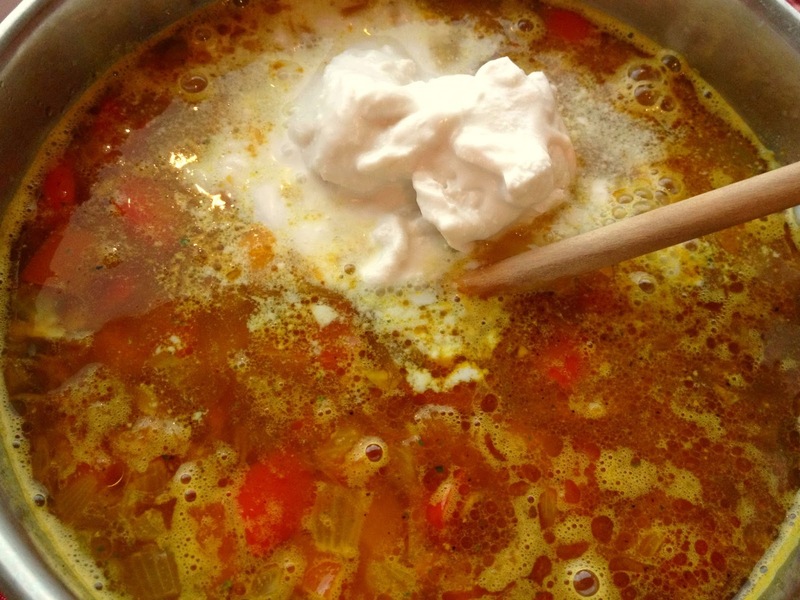 Add remaining ingredients and simmer 5-10 minutes. 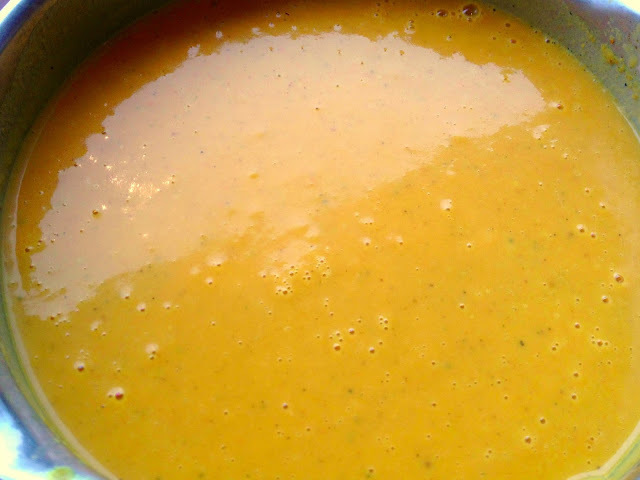 Puree carefully in a blender, or use a hand-held blender. Salt to taste and serve hot.